Kimberly W. McDermott, Ph.D., Carol Stocks, Ph.D., R.N., and William J. Freeman, M.P.H. Although some ill and injured children are treated at children's hospitals or large pediatric units of medical centers, the vast majority are brought to community hospital EDs.6 In recent years, national experts have raised concerns about pediatric emergency preparedness in community hospitals and have released guidelines to promote greater equity in pediatric emergency care.7,8 Updated information on patient characteristics and common conditions associated with pediatric ED visits may provide additional insight into the unique needs of the pediatric population and assist community EDs in improving their pediatric care resources. This Healthcare Cost and Utilization Project (HCUP) Statistical Brief presents data on pediatric ED visits (excluding births), with children defined as patients aged 18 years or younger.9 The time frame of focus is fiscal year (FY) 2015 (from quarter 4 [Q4] of 2014 through Q3 2015), with comparison data provided for FY 2007 through FY 2014.10 In this Statistical Brief, FY 2015 will hereinafter be referred to as 2015, FY 2014 will be referred to as 2014, and so forth. The number and rate of pediatric ED visits are compared with adult ED visits in 2015 for three visit types: all ED visits, treat-and-release ED visits, and ED visits resulting in admission to the same hospital. Patient characteristics are presented for pediatric ED visits across these same categories. Trends in pediatric ED visits from 2007 through 2015 are provided by expected primary payer. The most common reasons for pediatric ED visits by body system in 2015 are presented, along with the most common respiratory conditions by age group. Finally, seasonal variation in pediatric ED visits involving respiratory conditions and injuries for 2011 through 2015 are provided. Differences greater than 10 percent between estimates are noted in the text. Table 1 compares pediatric ED visits with adult ED visits in 2015. Visit totals and population rates are presented for all ED visits, treat-and-release ED visits, and ED visits resulting in hospital admission, among patients aged 18 years or younger, patients aged 19–64 years, and patients aged 65 years and older. Corresponding U.S. population totals are presented for comparison. In 2015, there were 30 million ED visits for children aged 18 years or younger, with a rate of 382.9 per 1,000 population. The vast majority of these visits (96.7 percent) were treat and release. Infants and children aged <5 years, representing 25.5 percent of all children in the U.S. population, accounted for more than 40 percent of pediatric ED visits in 2015. Medicaid was the expected primary payer for more than 60 percent of pediatric ED visits in 2015. The number of pediatric ED visits covered by Medicaid increased by more than 50 percent from 2007 to 2015. During 2011 through 2015, pediatric ED visits for respiratory conditions peaked from October through March, whereas injury-related ED visits were more frequent from April through September. Respiratory disorders, and injury and poisoning were the most common reasons for pediatric ED visits in 2015. In 2015, upper respiratory diseases and infections were the most common respiratory-related ED diagnoses across all pediatric age groups, with the highest rate among infants aged <1 year. The younger the pediatric age group, the higher the rate of ED visits for influenza in 2015. Notes: Pediatric ED visits exclude births. Totals are rounded to the nearest hundred. a To adjust for use of fiscal year data, U.S. population estimates were calculated as the sum of one-quarter of the 2014 population and three-quarters of the 2015 population. b Among treat-and-release pediatric ED visits, the majority resulted in routine discharge (88.3%). Others resulted in transfer to a short-term hospital (1.4%), transfer to another type of facility (0.7%), discharge against medical advice (0.7%), or discharge to an unknown destination (8.8%). Death in the ED and discharge to home health care each accounted for less than 0.1% of discharges. Children had a lower rate of ED visits than adults in 2015. In 2015, there were approximately 30 million pediatric ED visits, with a rate of 382.9 per 1,000 population. This rate was lower than the rate of ED visits among adult patients aged 19–64 years (502.6 per 1,000) and patients aged 65 years and older (576.5 per 1,000). Fewer than 5 percent of pediatric ED visits resulted in admission to the same hospital. In 2015, 96.7 percent of pediatric ED visits were treat and release, compared with 89.0 percent of visits among patients aged 19–64 years and 65.9 percent of visits among patients aged 65 years and older. Table 2 presents patient characteristics for all pediatric ED visits, treat-and-release pediatric ED visits, and pediatric ED visits resulting in hospital admission in 2015. Corresponding U.S. population totals are presented as a means of comparison. Notes: Pediatric ED visits exclude births. Totals are rounded to the nearest hundred. The "other" payer category does not include missing values. b Population data are not available for primary expected payer categories. Children younger than 5 years of age accounted for more than 40 percent of pediatric ED visits in 2015. The two youngest pediatric age groups—infants younger than 1 year old and children aged 1–4 years—constituted a disproportionately high share of pediatric ED visits. Whereas these age groups accounted for 5.1 and 20.4 percent of the U.S. population, respectively, their treat-and-release ED visits comprised 11.0 and 29.5 percent of all pediatric treat-and-release visits. Infant ED visits accounted for an event greater share (21.3 percent) of admitted pediatric ED visits. Children aged 5–9 years and 10–14 years accounted for a disproportionately low share of pediatric ED visits. This was particularly the case for ED visits resulting in hospital admission. These two age groups each constituted approximately 26 percent of the U.S. population but accounted for only 15.8 and 16.1 percent of admitted pediatric ED visits, respectively. Children aged 15–18 years accounted for 22.1 percent of the U.S. population and a similar share of pediatric treat-and-release and admitted ED visits (19.7 and 23.7 percent, respectively). Overall, the proportion of pediatric ED visits was inversely related to community-level income, with children in the lowest income quartile constituting more than a third of pediatric ED visits. In 2015, children in the lowest income quartile constituted a disproportionately high share of pediatric ED visits. This group accounted for 26.6 percent of the U.S. population aged 18 years and younger and 36.4 percent of pediatric ED visits. Conversely, the highest income quartile constituted a disproportionately low share of pediatric ED visits, accounting for 24.9 percent of the U.S. population and only 15.3 percent of pediatric ED visits. More than 60 percent of pediatric ED visits in 2015 were covered by Medicaid. Medicaid was the most common primary expected payer among pediatric treat-and-release and admitted ED visits, accounting for 61.6 percent and 59.0 percent of visits, respectively. This was followed by private insurance, which was the expected payer for 28.0 percent of treat-and-release visits and 34.8 percent of ED visits resulting in hospital admission. Pediatric ED visits for patients with no insurance were less common, constituting 6.4 percent and 2.7 percent of treat-and-release and admitted pediatric ED visits, respectively. Figure 1 presents the number of pediatric ED visits (treat and release or admitted) by expected primary payer from 2007 through 2015. Notes: Pediatric ED visits exclude births. The "other" payer category does not include missing values. Percent change is reported based on nonrounded values. Line graph that shows the number of pediatric ED visits in millions by expected primary payer for FY 2007 to FY 2015. Medicaid: increased steadily from 12.3 in 2007 to 17.2 in 2013, declined to 16.6 in 2014, and increased to 18.5 in 2015, for a cumulative increase of 51.0%. Private insurance: increased from 11.8 in 2007 to 12.0 in 2008, decreased steadily to 7.8 in 2014, and increased to 8.5 in 2015, for a cumulative decrease of 28.2%. Uninsured: decreased steadily from 3.3 in 2007 to 2.2 in 2011, increased to 2.3 in 2012, decreased steadily to 1.9 in 2014 and 2015, for a 42.7% cumulative decrease. Other (including Medicare): held steady at 1.2 from 2007 to 2010, decreased to 1.1 in 2011, increased to 1.3 in 2012, decreased steadily to 1.1 in 2014 and 2015, for a cumulative decrease of 7.9%. The number of pediatric ED visits covered by Medicaid generally increased from 2007 to 2015, whereas the number of visits covered by other types of insurance generally decreased. Apart from a decline from 2013 to 2014, the number of pediatric ED visits with Medicaid as the primary expected payer increased steadily from 12.3 million in 2007 to 18.5 million in 2015—a 51.0 percent cumulative increase. During the same period, the number of pediatric ED visits with private insurance as the expected payer decreased from 11.8 million to 8.5 million (a 28.2 percent decrease) and the number of visits among uninsured pediatric patients decreased from 3.3 million to 1.9 million (a 42.7 percent decrease). Figure 2 shows the most common reasons for all pediatric ED visits by body system, based on all-listed diagnoses in 2015. Notes: Pediatric ED visits exclude births. Totals are rounded to the nearest hundred. Body systems are based on the Healthcare Cost and Utilization Project (HCUP) Clinical Classifications Software (CCS) and represent all-listed diagnoses. Only body systems with at least one million pediatric ED visits are shown. A single visit is counted only once per body system designation. Categories are not mutually exclusive. 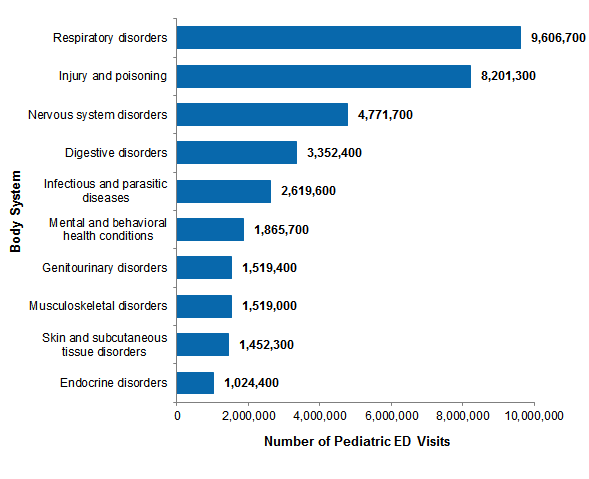 Bar chart shows the number of pediatric ED visits for the 10 most common reasons in FY 2015. Respiratory disorders: 9,606,700. Injury and poisoning: 8,201,300. Nervous system disorders: 4,771,700. Digestive disorders: 3,352,400. Infectious and parasitic diseases: 2,619,600. Mental and behavioral health conditions: 1,865,700. Genitourinary disorders: 1,519,400. Musculoskeletal disorders: 1,519,000. Skin and subcutaneous tissue disorders: 1,452,300. Endocrine disorders: 1,024,400. Respiratory disorders, and injury and poisoning (combined) were the most common reasons for pediatric ED visits in 2015. In 2015, 9.6 million pediatric ED visits involved respiratory disorders and 8.2 million pediatric ED visits involved injury or poisoning. Other common reasons included nervous system disorders (4.8 million visits), digestive disorders (3.4 million), and infectious or parasitic diseases (2.6 million). Figure 3 focuses on the most common reasons for pediatric ED visits—respiratory disorders—and presents population rates for six categories of first-listed ED respiratory diagnoses, by pediatric age group, in 2015. Notes: Pediatric ED visits exclude births. To adjust for use of fiscal year data, population denominators for rates were calculated as the sum of one-quarter of the 2014 population and three-quarters of the 2015 population. Rate is based on first-listed diagnoses, grouped using the Healthcare Cost and Utilization Project (HCUP) Clinical Classifications Software (CCS). Upper respiratory diseases and infections represent three CCS categories: Acute and chronic tonsillitis; Other upper respiratory infections (e.g., streptococcal sore throat and acute laryngitis); and Other upper respiratory disease (e.g., allergic rhinitis and deviated nasal septum). Other upper respiratory infections constituted the vast majority (88.6 percent) of pediatric ED visits in this category. Lower respiratory diseases represent five CCS categories: Other lower respiratory disease (e.g., wheezing and cough), Chronic obstructive pulmonary disease (COPD) and bronchiectasis; Pleurisy, pneumothorax, pulmonary collapse; Aspiration pneumonitis, food vomitus; and Lung disease due to external agents. Other lower respiratory disease accounted for the vast majority (75.7 percent) of pediatric ED visits in this category. As defined here, upper respiratory includes the nose, sinus, throat, larynx, and trachea. Lower respiratory includes the bronchial tubes and lungs. 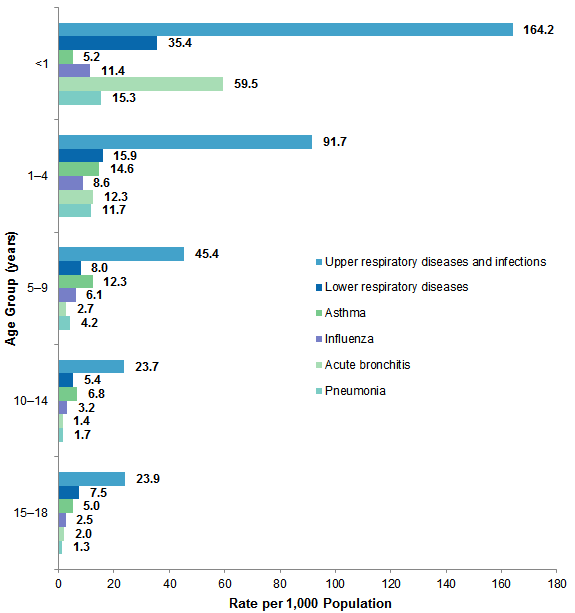 Bar chart that shows the rate per 1,000 population of pediatric ED visits for six categories of first-listed respiratory conditions by age in FY 2015. 15–18 years: Upper respiratory diseases and infections, 23.9; lower respiratory diseases, 7.5; asthma, 5.0; influenza, 2.5; acute bronchitis, 2.0; pneumonia, 1.3. 10–14 years: Upper respiratory diseases and infections, 23.7; lower respiratory diseases, 5.4; asthma, 6.8; influenza, 3.2; acute bronchitis, 1.4; pneumonia, 1.7. 5–9 years: Upper respiratory diseases and infections, 45.4; lower respiratory diseases, 8.0; asthma, 12.3; influenza, 6.1; acute bronchitis, 2.7; pneumonia, 4.2. 1–4 years: Upper respiratory diseases and infections, 91.7; lower respiratory diseases, 15.9; asthma, 14.6; influenza, 8.6; acute bronchitis, 12.3; pneumonia, 11.7. <1 year: Upper respiratory diseases and infections, 164.2; lower respiratory diseases, 35.4; asthma, 5.2; influenza, 11.4; acute bronchitis, 59.5; pneumonia, 15.3. Upper respiratory diseases and infections were the most common respiratory-related ED diagnoses across all pediatric age groups in 2015, with the highest rates among younger age groups. Among the youngest two pediatric age groups, the population rate of ED visits for upper respiratory diseases and infections, lower respiratory diseases, and pneumonia was triple (for infants) and double (for children aged 1–4 years) the corresponding rates for older children. For example, infants aged younger than 1 year and children aged 1–4 years had higher rates of ED visits with a first-listed diagnosis of upper respiratory disease or infection—164.2 and 91.7 per 1,000 population, respectively—compared with older pediatric age groups (which ranged from 23.7 to 45.4 per 1,000 population). In 2015, the population rate of ED visits for acute bronchitis among infants was nearly 5 times higher than the rate among children aged 1–4 years and more than 22 times higher than the rates among older pediatric age groups. Among infants aged younger than 1 year, the rate of ED visits for acute bronchitis was 59.5 per 1,000 population. This was nearly 5 times higher than the rate for the next oldest pediatric age group (12.3 per 1,000 children aged 1–4 years) and more than 22 times higher than rates among the oldest three pediatric age groups (which ranged from 1.4 to 2.7 per 1,000 population). In 2015, the rate of ED visits with a first-listed diagnosis of asthma was highest among children aged 1–4 years and 5–9 years. First-listed ED diagnoses of asthma were most frequent among children aged 1–4 years (14.6 visits per 1,000 population) and children aged 5–9 years (12.3 visits per 1,000 population). At a rate of 5.2 per 1,000 population, ED visits for asthma were relatively uncommon among infants compared with ED visits for other respiratory conditions. In contrast, among older pediatric age groups, asthma was the second or third most common category of first-listed ED conditions. The younger the age group, the higher the rate of ED visits for influenza in 2015. Infants younger than 1 year had the highest rate of ED visits for influenza among pediatric age groups (11.4 per 1,000 population). Rates of ED visits with a first-listed diagnosis of influenza were inversely related to age, with the lowest rate of 2.5 per 1,000 population observed among children aged 15–18 years. Figure 4 presents quarterly trends for two common reasons for pediatric ED visits—respiratory conditions and injuries—from 2011 through 2015. Although the condition category reported in Figure 2 includes both injuries and poisonings, this figure is limited to injury diagnoses to highlight the seasonal variation associated with these conditions. Totals are based on all-listed diagnoses. Note: Pediatric ED visits exclude births. Totals are based on all-listed diagnoses. Body systems are based on the Healthcare Cost and Utilization Project (HCUP) Clinical Classifications Software (CCS). Although this classification system combines injury and poisoning diagnosis categories, Figure 4 was limited to injury-related CCS diagnosis categories. 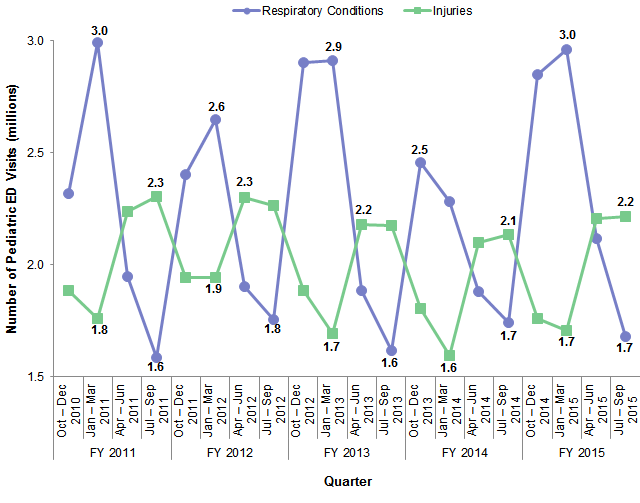 Line graph that shows the number of ED visits in millions for respiratory conditions and injuries by quarter for FY 2011 to FY 2015. Respiratory conditions: FY 2011: Q32010, 2.3; Q12011, 3.0; Q22011, 1.9; Q32011, 1.6; FY 2012: Q42011, 2.4; Q12012, 2.6; Q22012, 1.9; Q32012, 1.8; FY 2013: Q42012, 2.9; Q12013, 2.9; Q22013, 1.9; Q32013, 1.6; FY 2014: Q42013, 2.5; Q12014, 2.3; Q22014, 1.9; Q32014, 1.7; FY 2015: Q42014, 2.8; Q12015, 3.0; Q22015, 2.1; Q32015, 1.7. Injuries: FY 2011: Q32010, 1.9; Q12011, 1.8; Q22011, 2.2; Q32011, 2.3; FY 2012: Q42011, 1.9; Q12012, 1.9; Q22012, 2.3; Q32012, 2.3; FY 2013: Q42012, 1.9; Q12013, 1.7; Q22013, 2.2; Q32013, 2.2; FY 2014: Q42013, 1.8; Q12014, 1.6; Q22014, 2.1; Q32014, 2.1; FY 2015: Q42014, 1.8; Q12015, 1.7; Q22015, 2.2; Q32015, 2.2. From 2011 through 2015, the number of pediatric ED visits involving respiratory conditions consistently peaked during the months of October through March. During 2011 through 2015, the number of pediatric ED visits associated with respiratory conditions demonstrated strong seasonal variation, with higher volumes from October through March compared with April through September. In FY 2015, for example, there were 2.8 and 3.0 million respiratory-related pediatric ED visits during the quarterly periods of October through December (Q4 2014) and January through March (Q1 2015), respectively, and only 2.1 and 1.7 million visits during April through June (Q2 2015) and July through September (Q3 2015), respectively. This equates to a 43.4 percent decrease from the highest volume quarter (October through December) to the lowest volume quarter (July through September) of that fiscal year. Children visited the ED with injuries most frequently during the months of April through September in 2011–2015. Pediatric ED visits involving injury diagnoses showed a clear seasonality from 2011 through 2015. Injury-related visits were far more prevalent from April through September compared with October through March. This pattern was exemplified in FY 2015, when there were 2.2 million injury-related pediatric ED visits in both periods of April through June (Q2 2015) and July through September (Q3 2015), compared with 1.8 and 1.7 million visits during October through December (Q4 2014) and January through March (Q1 2015), respectively. The volume of pediatric ED visits associated with injuries increased by 29.9 percent between the lowest volume quarter (January through March) and the highest volume quarter (July through September) of FY 2015. Healthcare Cost and Utilization Project (HCUP) Statistical Briefs provide basic descriptive statistics on a variety of topics using HCUP administrative health care data. Topics include hospital inpatient, ambulatory surgery, and emergency department (ED) use and costs, quality of care, access to care, medical conditions, procedures, and patient populations, among other topics. The reports are intended to generate hypotheses that can be further explored in other research; the reports are not designed to answer in-depth research questions using multivariate methods. For this Statistical Brief, fiscal year (FY) was used. FY includes October through December of one year and January through September of the following year, thereby including all four seasons, as does calendar year. Beginning FY 2016, on October 1, 2015, the United States transitioned from the International Classification of Diseases, Ninth Revision, Clinical Modification (ICD-9-CM) clinical coding system to the International Classification of Diseases, Tenth Revision, Clinical Modification/Procedure Coding System (ICD-10-CM/PCS) clinical coding system. Although the impact of the change in coding systems on pediatric ED diagnoses has not been studied directly, the change has been observed to result in substantial shifts in the overall number of ED visits for some of the most frequent diagnoses.13 Although the coding change did not affect calendar years prior to 2015, FYs for all data reported in this Statistical Brief (2007–2015) were used to allow for comparability across years. The first-listed diagnosis is the condition, symptom, or problem identified in the medical record to be chiefly responsible for the emergency department (ED) services provided. For ED visits that result in an inpatient admission to the same hospital, the first-listed diagnosis is the principal diagnosis, the condition established after study to be chiefly responsible for the patient's admission to the hospital. All-listed diagnoses include the first-listed diagnosis plus concomitant conditions that coexist at the time of the visit. CCS categorizes ICD-9-CM diagnosis codes into a manageable number of clinically meaningful categories.14 This clinical grouper makes it easier to quickly understand patterns of diagnoses. CCS categories identified as Other typically are not reported; these categories include miscellaneous, otherwise unclassifiable diagnoses that may be difficult to interpret as a group. The single-level CCS aggregates illnesses and conditions into 285 mutually exclusive diagnosis categories. The multilevel CCS expands the single-level CCS into a hierarchical system that groups single-level CCS categories into broader body systems or condition categories (e.g., Diseases of the Respiratory System and Injury and Poisoning). For this report, pediatric ED visits were defined as ED visits involving patients aged 18 years or younger. ED visits for births were excluded. Births were identified as having an ICD-9-CM diagnosis code of V3000 through V3901, with the last two digits being 00 or 01 in any diagnosis field. ED visits include information on all visits to hospital-owned EDs regardless of whether the patient was treated and released from that ED or admitted to the same hospital from the ED. Treat-and-release ED visits were defined as those ED visits in which patients were treated and then released from the ED; that is, patients were not admitted to the specific hospital associated with the ED. The unit of analysis is the ED visit, not a person or patient. This means that a person who is seen in the ED multiple times in 1 year will be counted each time as a separate visit in the ED. Place of residence is based on the urban-rural classification scheme for U.S. counties developed by the National Center for Health Statistics (NCHS) and based on the Office of Management and Budget (OMB) definition of a metropolitan service area as including a city and a population of at least 50,000 residents. Micropolitan and Noncore: Counties in a nonmetropolitan area (i.e., counties with no town greater than 49,999 residents). Community-level income is based on the median household income of the patient's ZIP Code of residence. Quartiles are defined so that the total U.S. population is evenly distributed. Cut-offs for the quartiles are determined annually using ZIP Code demographic data obtained from Claritas, a vendor that adds value to data from the U.S. Census Bureau.15 The value ranges for the income quartiles vary by year. The income quartile is missing for patients who are homeless or foreign. Other: includes Medicare, Workers' Compensation, TRICARE/CHAMPUS, CHAMPVA, Title V, and other government programs. Note that for this Statistical Brief, Medicare is included in the Other category because of the small number of children covered by the Medicare Program. For this Statistical Brief, when more than one payer is listed for a hospital discharge, the first-listed payer is used. Discharge status reflects the disposition of the patient at discharge from the ED and includes the following seven categories: routine (to home); transfer to a different short-term hospital; other transfers (including skilled nursing facility, intermediate care, and another type of facility such as a nursing home); home health care; against medical advice (AMA); died in the hospital; or destination unknown. For other information on pediatric emergency department (ED) visits and hospital stays, refer to the HCUP Statistical Briefs located at www.hcup-us.ahrq.gov/reports/statbriefs/sb_pediatric.jsp. Agency for Healthcare Research and Quality. Overview of the Nationwide Emergency Department Sample (NEDS). Healthcare Cost and Utilization Project (HCUP). Rockville, MD: Agency for Healthcare Research and Quality. Updated December 2017. www.hcup-us.ahrq.gov/nedsoverview.jsp. Accessed January 18, 2018. McDermott KW (IBM Watson Health), Stocks C (AHRQ), Freeman WJ (AHRQ). Overview of Pediatric Emergency Department Visits, 2015. HCUP Statistical Brief #242. August 2018. Agency for Healthcare Research and Quality, Rockville, MD. www.hcup-us.ahrq.gov/reports/statbriefs/sb242-Pediatric-ED-Visits-2015.pdf. This Statistical Brief was posted online on August 7, 2018. 2 National Center for Health Statistics. Health, United States, 2016: With Chartbook on Long-Term Trends in Health. Table 73. Emergency Department Visits Within the Past 12 Months Among Children Under Age 18, by Selected Characteristics: United States, Selected Years 1997–2015. Centers for Disease Control and Prevention, National Center for Health Statistics. www.cdc.gov/nchs/data/hus/hus16.pdf#073. Accessed April 4, 2018. 3 Wier LM, Yu H, Owens PL, Washington R. Overview of Children in the Emergency Department, 2010. HCUP Statistical Brief #157. June 2013. Agency for Healthcare Research and Quality, Rockville, MD. www.hcup-us.ahrq.gov/reports/statbriefs/sb157.pdf. 4 Cohen HA, Blau H, Hoshen M, Batat E, Balicer RD. Seasonality of asthma: a retrospective population study. Pediatrics. 2014;133(4):e923–32. 5 Saps M, Blank C, Khan S, Seshadri R, Marshall BM, Bass LM, et al. Seasonal variation in the presentation of abdominal pain. Journal of Pediatric Gastroentrology and Nutrition. 2008;46(3):279–84. 6 American Academy of Pediatrics, Committee on Pediatric Emergency Medicine; American College of Emergency Physicians, Pediatric Committee; Emergency Nurses Association, Pediatric Committee. Joint policy statement: guidelines for care of children in the emergency department. Journal of Emergency Nursing. 2013;39(2):116–31. 7 American Academy of Pediatrics, Committee on Pediatric Emergency Medicine; American College of Emergency Physicians, Pediatric Committee; Emergency Nurses Association, Pediatric Committee. Joint policy statement: guidelines for care of children in the emergency department. Journal of Emergency Nursing. 2013;39(2):116–31. 8 Institute of Medicine, Committee of the Future of Emergency Care in the US Health System. Emergency Care for Children: Growing Pains. Washington, DC: National Academy Press; 2006. 9 This definition aligns with the definition of child used by the Children's Health Insurance Program (CHIP) to determine eligibility. 10 FYs were used in this Statistical Brief because beginning FY 2016, on October 1, 2015, the United States transitioned from the International Classification of Diseases, Ninth Revision, Clinical Modification (ICD-9-CM) clinical coding system to the International Classification of Diseases, Tenth Revision, Clinical Modification/Procedure Coding System (ICD-10-CM/PCS) clinical coding system. Although the impact of the change in coding systems on pediatric ED diagnoses has not been studied directly, the change has been observed to result in substantial shifts in the overall number of ED visits for some of the most frequent diagnoses (ref. Moore BJ, McDermott KW, Elixhauser A. ICD-10-CM Diagnosis Coding in HCUP Data: Comparisons With ICD-9-CM and Precautions for Trend Analyses. November 28, 2017. Rockville, MD: U.S. Agency for Healthcare Research and Quality. 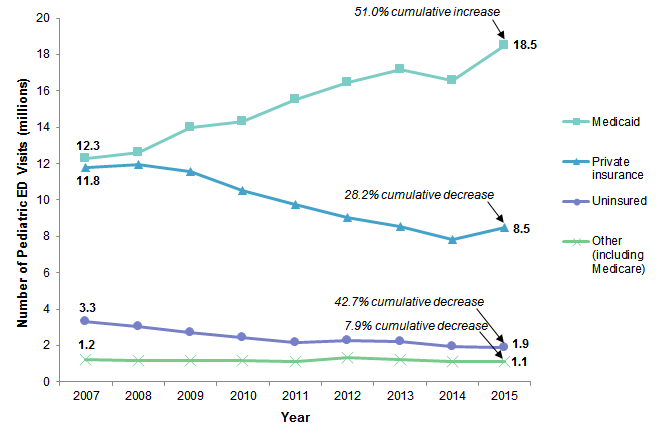 www.hcup-us.ahrq.gov/datainnovations/ICD-10_DXCCS_Trends112817.pdf). Although the coding change did not affect calendar years prior to 2015, FYs for all data reported in this Statistical Brief (2007–2015) were used to allow for comparability across years. 11 Barrett M, Coffey R, Levit K. Population Denominator Data for Use with the HCUP Databases (Updated with 2016 Population Data). HCUP Methods Series Report #2017-04. October 17, 2017. U.S. Agency for Healthcare Research and Quality. www.hcup-us.ahrq.gov/reports/methods/2017-04.pdf. Accessed January 18, 2018. 12 Claritas. Claritas Demographic Profile by ZIP Code. https://claritas360.claritas.com/mybestsegments/. Accessed June 6, 2018. 13 Moore BJ, McDermott KW, Elixhauser A. ICD-10-CM Diagnosis Coding in HCUP Data: Comparisons With ICD-9-CM and Precautions for Trend Analyses. November 28, 2017. U.S. Agency for Healthcare Research and Quality. https://www.hcup-us.ahrq.gov/datainnovations/ICD-10_DXCCS_Trends112817.pdf. Accessed, July 5, 2018. 14 Agency for Healthcare Research and Quality. HCUP Clinical Classifications Software (CCS) for ICD-9-CM. Healthcare Cost and Utilization Project (HCUP). Agency for Healthcare Research and Quality. Updated March 2017. www.hcup-us.ahrq.gov/toolssoftware/ccs/ccs.jsp. Accessed January 18, 2018. 15 Claritas. Claritas Demographic Profile by ZIP Code. https://claritas360.claritas.com/mybestsegments/. Accessed June 6, 2018. Internet Citation: Statistical Brief #242. Healthcare Cost and Utilization Project (HCUP). August 2018. Agency for Healthcare Research and Quality, Rockville, MD. www.hcup-us.ahrq.gov/reports/statbriefs/sb242-Pediatric-ED-Visits-2015.jsp.